The rainbow face may be in violation of the country's "gay propaganda" ban. It’s like The Wizard of Oz, but in reverse. 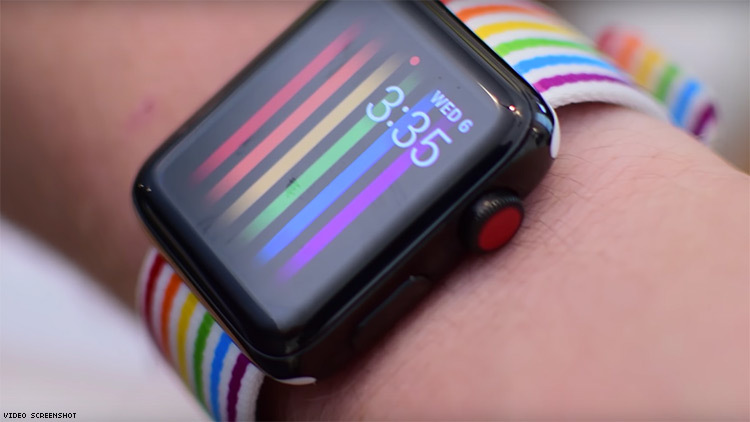 When an owner of an Apple Watch goes to Russia, the rainbow face will disappear from its display. Why? Guilherme Rambo, a developer and a writer on the Apple-focused blog 9to5Mac, claimed this display “is hardcoded to not show up if the paired iPhone is using the Russian locale,” in a Thursday tweet. Rambo also posted a screenshot of coding as proof of this claim. The Verge confirmed in a test that the rainbow display disappears in the Russian locale. Apple, which is run by out CEO Tim Cook, released the rainbow display in June to celebrate Pride Month. The company has not yet commented on the allegation that it “hardcoded” these colors to vanish in the antigay country. A rainbow band, which benefits LGBTQ organizations like the Trevor Project, is also not available for sale in Russia. In Russia, so-called gay propaganda — which includes any display of LGBTQ Pride — is banned in public spaces where it could be viewed by minors. The scope of its definition is broad. Russia has cited “gay propaganda” in its crackdown on protests as well as photographs posted on Facebook, meaning Apple’s Pride face could be in violation of the law. The ban has been condemned by international activists as a discriminatory means of suppressing the voices of a marginalized community.